I haven’t been on this page for a time, but I decided to spread the word about “Captured by the Enemy” in a fun and nontraditional way. My daughter was going to L.A. for a concert this last weekend, and with it being Veteran’s day, I wanted to do something different. I attached a sticker and sent 4 books with her. I couldn’t send more because it was a short trip and she didn’t have extra room to carry a lot of books. However, while she was there, I had her randomly leave the books at different places. This is a short video to tell a bit of what I did and what will come next. Join in on the fun. If you live in a big city, or you know some great places to leave a book, let me know. This could be a lot of fun! This week I haven’t been feeling well. In fact, my eardrum burst in my left ear…twice, and it still hurts. So I sit here with pain shooting through my ear, trying not to think of the pain by thinking about how I can make this page better. On Tuesday, November 14, I had a marketing meeting with Lisa Frederickson about my book, Captured by the Enemy. We are working on making my Amazon page better. She suggested that I send a message to Chuck Bartok, another marketing genius who has worked with books similar to mine. My philosophy is that it doesn’t hurt to ask, so I sent him a message. Would you believe that he messaged me right back and offered to call me on the phone? A busy man with 57 years of marketing experience! He started at a young age and never quit learning. We talked on the phone for over an hour, and he looked at my FB pages and my website and gave me suggestions and advice as I tried to jot down the golden nuggets of knowledge. I have to say that I was slightly embarrassed by my lack of current posts on here. It was just the kick in the pants that I needed to get me going again. He told me to share the stories I’ve experienced through my life because those are what make us who we are. That’s important because my life does not just consist of my book, and I can share that with you. Did you know that after the landing page, the second most visited page is the “About Me” page? I didn’t, but I plan to share more life experiences through here. Then, we talked about how we all work together to make things happen, and I believe that is true. I look forward to make new collaborations with others because I have great hope for this book and any future books that are to come. When I sent Chuck a thank you message, he sent this back, “Keep me posted. Remember there are no mistakes, just better ways to get it done. That is why I am a strong advocate of “masterminding” with peers. Been doing it for 57 years.” So my friends, that is why it is important to keep making connections, keep writing, keep sharing, and eventually sharing that great success that comes from it. We’re all in this together. Thank you for joining me on this journey. And the process of interviewing, gathering stories, researching, and writing began. “Captured by the Enemy” covers Good’s landing in North Africa with Patton’s 3rd Division. Aceves retraces his steps across North Africa and his preparation for a second amphibious landing into Sicily. The book shares Good’s stories of Sicily during WWII until he is captured by the enemy. After his capture, the book takes the reader through Good’s experiences in POW camps and participating in a mass prisoner escape into Italy. The book then shares Good’s harrowing life of living on the run for over nine months in the cold Italian mountains. It is a hard look at how the war and the stress from being hunted for so long changed him. It certainly was not an easy journey to put it all together. When Aceves came up with the idea, she was finishing college, had three young children, and flipped houses at least yearly with her husband and his real estate profession. Although the real estate career changed, the moving did not. As she worked on writing and researching, she lived in Kansas, Iowa, Texas, and Oklahoma. While in Texas, she and her husband had their fourth child. Despite the sleepless nights and exhausting days, Aceves was determined to finish this tribute to her grandfather and veterans like him. The last three years were filled with long, sleepless nights, but she was determined to finish—and finish she did. She chose to put a picture of her family on the back of the book because everyone was involved during the years it took to write it—and yes, she is struggling to keep up with the toddler. Lt. Col. John Oliver Williams. He was KIA (Killed in Action) on July 16, 1943 in Sicily. He was born in Pine Bluff, Arkansas on November 20, 1903 to Henry and Jennie(y). He married and had three children: John Jr. (1931), Nancy Ray, and Judith Ann in Texas. Perhaps we could connect with one of them. Private James (Jim) Martelli escaped from POW Camp 59 in a group of six with my granddad. He and my granddad paired off after a couple days and they remained in the Italian mountains until they headed to Allied lines over nine months after they escaped. They made it home, but Jim wanted to forget about everything that had happened and my granddad never heard from him again. His ASN (Army Serial Number) is 32423241 and he was from the Kings Co. New York area in the 1940s. Army Medical Dept. James (Jim) Snodgrass escaped with them from POW Camp 59. He was there for a longer period of time. His ASN is 20614252. He was enlisted in Illinois. Army Air Corps Staff Sgt. George Tucker escaped with them from POW Camp 59 in Italy. His ASN is 37175260 and was listed as being from Minnesota. He helped my granddad make it to the train that took them to Camp 59, after an explosion at the previous camp nearly took my granddad’s life. Army Air Corps Staff Sgt. James (Jim) Kingsland. There is some confusion on this name. It was reported that Kingsland went down on the same plane as Tucker. My granddad said they both arrived to the POW camp together. However, he pronounced the name as James Kingsley who was in the Air Corp as well. Nevertheless, Kingsland’s information matches better and it could have been just a misunderstanding in the pronunciation of the last name. I am going with Kingland, but searching for anyone who many have more information. Kingland’s ASN is 16024924 and he was also listed as being from Minnesota. He also helped Tucker get my granddad to the train that took them to Camp 59. PFC (Private First Class) Joseph Altomari. My granddad remembered the name as Joseph Olinix, but I could not find his information (British possibly?). However, Joseph Altomari was listed on the same paper as my granddad, Martelli, and Snodgrass after they made it back to Allied lines over nine months after escaping. This name needs to be proved. If you have any information on the name Olinix or Altomari, let me know. He also escaped from Camp 59 in Italy. Altomari’s ASN is 32105474 and he enlisted in Kings Co. New York. Please share this information and help me connect with the families of these men. Many men did not talk about their WWII experiences. In fact, my granddad did not open up until he was older. Every man and woman who serve in war should be recognized, and I hope that I can share these stories with the families of these men. Thank you to all of our veterans and active duty military–you are the silent heroes walking among us. 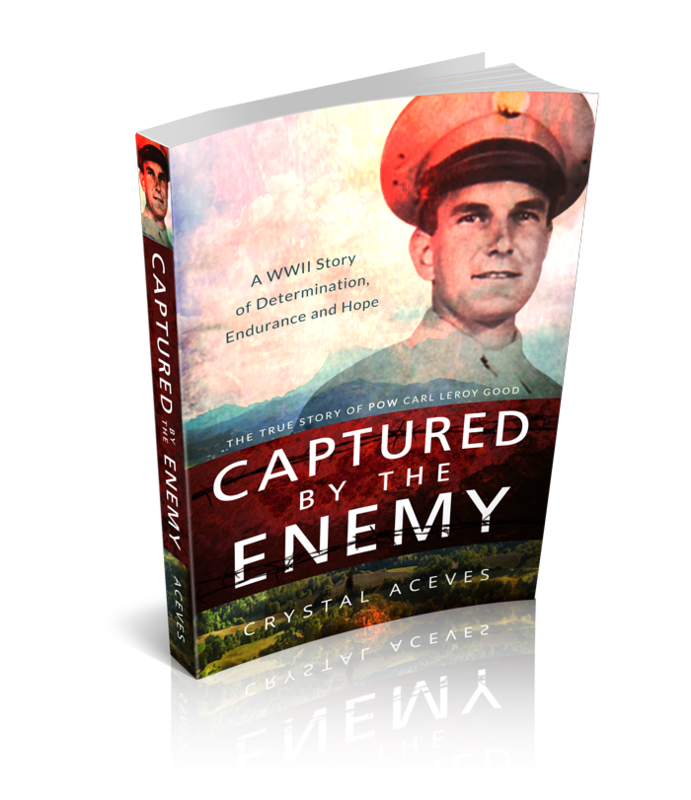 Get your signed copy of Captured by the Enemy now! Why should you buy this book–Captured by the Enemy? This book was written to retrace the steps of Carl Good through his WWII experiences. It combines history with his personal stories and recreates an amazing story. From his landing in North Africa to a second amphibious landing in Sicily, this book covers it all. When Carl was captured in Sicily, it details his experiences from the prison camps as he was moved ahead of Allied forces and into Italy. After a mass escape, he lived in the mountains of Italy for over nine months. Learning more about WWII couldn’t be more interesting as the stories carry the history along. Since the majority of the civilian draftees were hard-working and clean spoken, this book has kept true to that element. It is a clean read and makes for a true story without all the vulgar, gruesome Hollywood scenes (true stories only.) This is what makes this book stand out against the rest. It can be read by advanced readers who are ready for WWII material and the atrocities associated with it, or it is a great read for adults as well. Recently, it received a five star review on Amazon that compared it to the WWII book phenomenon–Unbroken. This one is for Carl–the quiet hero who never expected to be recognized, but deserved it through his amazing story of Captured by the Enemy. Buy it from Amazon, or pay safely through PayPal here and get a SIGNED copy from the author for only $19.95 plus discounted priority shipping!